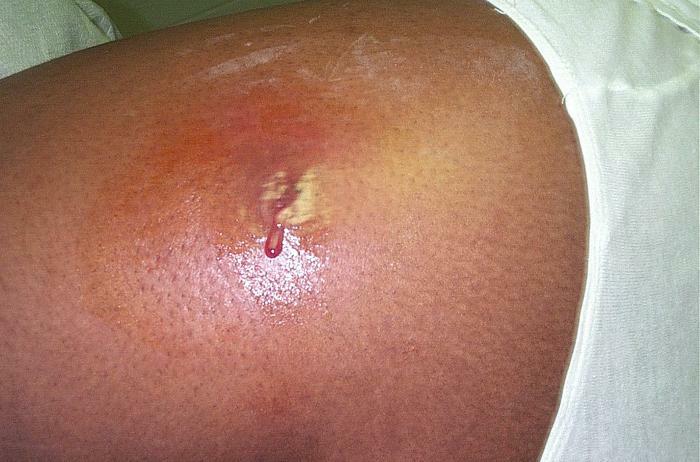 Description: This 2005 photograph depicted a cutaneous abscess located on the hip of a prison inmate, which had begun to spontaneously drain, releasing its purulent contents. The abscess was caused by methicillin-resistant Staphylococcus aureus bacteria, referred to by the acronym MRSA. S. aureus bacteria are amongst the populations of bacteria normally found existing on ones skin surface. However, over time, various populations of these bacteria have become resistant to a number of antibiotics, which makes them very difficult to fight when attempting to treat infections where MRSA bacteria are the responsible pathogens. These antibiotics include methicillin and other more common antibiotics such as oxacillin, penicillin and amoxicillin. Staph infections, including MRSA, occur most frequently among persons in hospitals and healthcare facilities such as nursing homes and dialysis centers, who have weakened immune systems, however, the manifestation of MRSA infections that are acquired by otherwise healthy individuals, who have not been recently hospitalized, or had a medical procedure such as dialysis, or surgery, first began to emerged in the mid- to late-1990's. These infections in the community are usually manifested as minor skin infections such as pimples and boils. Transmission of MRSA has been reported most frequently in certain populations, e.g., children, sports participants, or as was the case here, jail inmates. High Resolution: Right click here and select "Save Target As..." for hi-resolution image (15.56 MB) Content Providers(s): CDC/ Bruno Coignard, M.D. ; Jeff Hageman, M.H.S. This page was last modified on 7 January 2007, at 23:15.